It isn't the prettiest nor the fanciest nor the best executed Valentine's Day craft but for us here at the cottage, it probably means the most. This little heart (it's actually about 1 1/2" across) has been around for about four years now. I quickly made it for the girl when she was two and we were on our way to a playdate. A sparkly has worn off and the safety pin isn't THE most stylish but this crazy little heart means a lot to the girl. Isn't that just the way with six-year-olds? It doesn't have to be perfect; it just has to be made by Mom. She'll wear it again next week as usual. 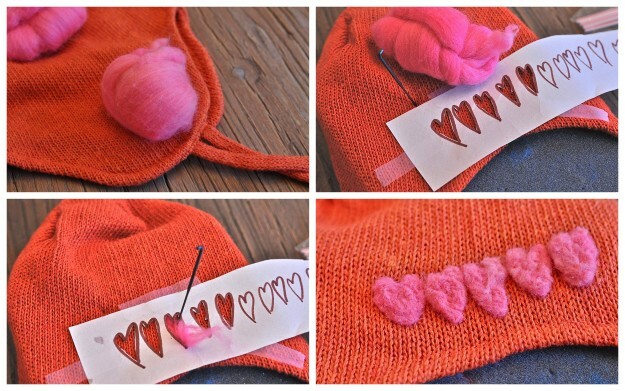 We have some other Valentine's Day crafts on deck for this weekend and I'll share some photos of them early next week. Today I did some quick felting on a toque (translation for the non-Canadians - "woolen hat"). I picked up the hat at American Apparel a few weeks ago thinking that I would do SOME felting but hadn't got around to it. First I needed a stencil. Before we headed off to school today I had the girl draw a row of hearts. I could have used a formal stencil with the hearts all perfectly aligned but I wanted something more organic and fresh looking. There is something about the originality of the line from a child's drawing. They just draw without the judgements of the inner critic that we adults often struggle with. I snipped out the hearts to make the stencil and taped it to the hat. Then felted. Here it is part way through the felting. One more step to go! Make sure that you spritz it with water and then iron with the wool setting. Done! Are you making anything for Valentine's Day?